I know I'm late to the Draw Something party, but the game sparks one of those unanswerable questions about human nature that I wish I could just plug into Google: "Why do people just write the words?" I get that the game is a little tedious after awhile, especially if you're impatient, but then why play? Personally, I wish I had a tablet instead of my little phone... I actually like the drawing interface. It's pretty simple, but you can do a lot with it once you have more than the standard colors. Another odd thing about the game is that no one seems to be able to spell anything, including adults. Bagel as "bagle?" Witch as "wich_?" Really? 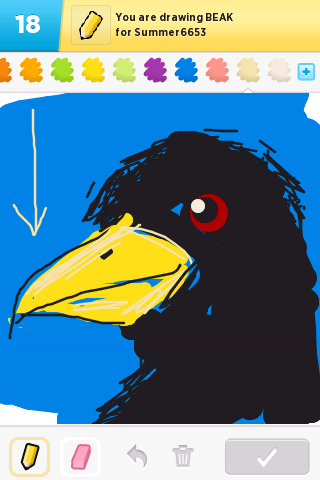 Anyway, here's a raven I was happy with... he looks a little like Dream's Matthew in Sandman/Brief Lives.